Please put your pickup/wiring discussions in the Electronics section; and put discussions about repair issues, including "disappearing" errors in new instruments, in the Repairs section. This is kind of brainstorming regarding possibilities and - moreover - layout. I am aware of the various approaches - mostly linear tuners, rarely lever based. Target instrument is a Bass VI, which means bass strings with a guitar like string spacing. A few estimates on the physics - lets start from the Schaller M4: transmission 1:12, width of buttons 33 mm. Axis width ~8.5-9 mm leading do a mid-mid diameter of the winding around the axis of roughly 10 mm, i.e. an outline of 30 mm. Which means one turn of the button will stretch the string by 2.5 mm. Now a linear tuner. Lets assume a thread of M4x0.7. ~3.5 turns are needed to move the string by those 2.5 mm. Unfortunately there is the diameter of the button: Guitar spacing means a button width of max 9.5 mm on a headless tuner. Which will quite exactly compensate for the advantage of the linear tuner over the threaded one. And which will make the string too hard to tune with the fingers. Mhmm. What will help? Finer threading? A lever based transmission (which can be tricky, especially if the mechanism shall be hidden)? Both? BTW: what range of adjustment would i need to provide in the mechanism? 1 cm? 1.5cm? 2 cm? More? How do you plan to fix the strings to the tuner? A clamp of some sort at one end? I might do a clamping nut and use the ball of the string at the tuner end. I think there are two modes of adjustment - initial to bring up to pitch, which would require much more adjustment than subsequent tuning. Can you separate those modes? Try taking an instrument with a known string post diameter and back off the tuning until the string just goes fully slack. That would be your initial clamping position for the string. count the turns of the knob until the string is back up to pitch. That will tell you how many turns of the string post it took, you know the circumference of the string post so you know the range of adjustment required from slack to tuned for that string. Add say two/three steps higher in tune for reasonable variance tighter, and that should be an acceptable range of motion, I would think. I bet you don't need all that much motion. I think ill use the ball end at the tuner side and clamp at the nut. But a lever based mechanism would make it easier to use the ball ends at the nut and clamp at the tuner. My main goal is to learn about useful mechanisms which allow tuning of bass strings (with small ball ends - bass VI, violin bass) with small tuning knobs. And then test that and a few other concepts in a playable prototype, maybe a 5 string shortscale bass. Of course i see that it has a tranmission larger than 1, which means that the forces needed to tune the instrument are increased. Possibly nothing for a bass guitar. ABM uses M3x.5 threads for their linear pull headless and I think that's a very useable thread pitch for smaller knobs. 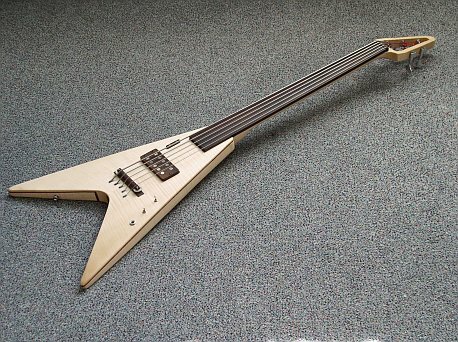 I did an 8 string headless octave bass a long time ago and used a staggered arrangement of knobs where some had long necks that fit between the others. It worked well enough. Lower strings only need 3-4 mm of range to come up to pitch. Higher strings might need 5-6mm but that's all even on a 36" bass. Keep it as simple as possible. Steel axis in brass body - reasonable choice? brass - relatively easy to work on and somewhat lubricating. ABM uses that combination as well, right? Related question: string angle at the bridge. As the tuners shall be "hidden" the strings shall go through the top and the tuning mechanism is underneath the top. Similarly to the Marleaux Pagelly or some Ritter basses. That would lead to a relatively large string angle at the bridge. Which again would make tuning more difficult, wouldn't it? Do You think, 23° is ok? He's had a few threads where he's showed machining these types of tuners. I think he worked on a few MIMF bases too. That 23º sounds like a lot for a bass string to go around but i'm sure it can be done. I use a 12º break angle at the bridge and an 8º at the headstock. Do a single string mock up an see what happens? Brass and aluminum also work well as a low friction bearing, The friction isn't going to be in the threads but where the point of contact is between the nut and what it's pushing against. Minimize the contact area for starters to reduce friction and then lubricate with moly grease or acetal washers or both. I've made replacement bridge saddles for a steinberger out of brass from McMasterCarr with nothing more than a drill press, a belt sander and a thread tap. Getting the string spacing as tight as you describe would be a problem but you wouldn't need to have the string spacing as narrow if the tuner assembly was in the form of a tailpiece and not a combo bridge/tailpiece. The string spacing could be wider at the tuner assembly if you employed something like a tunematic bridge. Well the tuner block and bridge could all be milled from matching wood preferably acrylic infused wood for durability. What about using a roller saddle as seen on pedal steel guitars? You could probably have a 90 degree break angle as long as you can bolt the bridge down effectively. I'll check what materials are available here in the stores - it is getting more and more difficult to find suitable starting materials here. If you stagger the tuners you can get a larger diameter out of them. I can post of picture of what I am talking about if you need it. If you know what to look for many starting materials are available on eBay. Perusing the on line mcmaster catalogue is very informative too. Here's an example of what Barry is talking about. Today i bought some cheap wood for a prototype, and i'm going test and practice a few other things except the tuning system as well. With a drill press you can turn some nice wooden tuning knobs. Start with brass threaded inserts and then use a cap screw as a mandrel in your drill press chuck. The inserts get pressed or threaded into wood blocks to become the knobs. Preston style tuners or a mod thereof might be a viable option. I made some using cap head screws and used an allen key to provide the leverage rather than a knob. Simple and cheap to construct and with a little bit of ingenuity hideable . David King wrote: With a drill press you can turn some nice wooden tuning knobs. Start with brass threaded inserts and then use a cap screw as a mandrel in your drill press chuck. The inserts get pressed or threaded into wood blocks to become the knobs. That is just about the coolest thing I've ever heard. Is there a YouTube out there on turning on a drill press? I'd love to actually SEE it being done before I give it a try, and I'm definitely going to give that a try! Clay Schaeffer wrote: Preston style tuners or a mod thereof might be a viable option. I made some using cap head screws and used an allen key to provide the leverage rather than a knob. Simple and cheap to construct and with a little bit of ingenuity hideable . What exactly are Preston style tuners? Something like that? These appear to me more or less normal linear tuners, just mounted at the headstock and requiring a tuning key. Might actually be a design option, but for a scale of 76 cm? And the weight might be an issue (or not; it at least requires evaluation). The geometry would be difficult; especially in a V the accessibility will probably a problem. On a normal scale guitar headstock and with an easier to use mounting mechanism it might indeed be an interesting design option. Addon: i expect the Preston tuners to be comparatively heavy. But the idea might help reducing the neck angle if the tuners are located on the bridge side - slots in the top are necessary anyway. What i actually want to hide are mostly the tuning knobs. That type of preston tuner uses a "clock key" to tune the strings. I used cap head screws which have a recess for an allen key. That allows more leverage and less hand strain for tuning. Some waldzithers have small knobs which don't require a separate key, and sometimes stagger the rows (one above the other) to make a compact head. The end that requires a key could be buried in the body or peghead so only the slots and posts would show. It might look cool if the slots were inset in the body and arranged in the shape of a "V" like a small grill below the bridge. My musings. P.S. Preston tuners are actually comparatively light in weight.